Location will be announced closer to the event. In the Charlotte area. Buildings and structures in the landscape add interest, variety, and help tell a story. Nancy shares how to compose, simplify, and seamlessly incorporate structures using underpainting techniques, abstract shapes, shadow and light patterns, texture, and perspective, to enhance your landscape paintings. 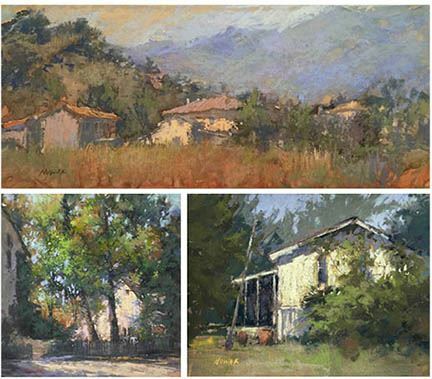 Nancy’s demos will include discussion on materials, composition, value studies, color temperatures and color harmony, importance of simplifying, massing, underpainting, and discussion on what makes a successful painting.